Licenses and permits are widely used in most countries and states. In most countries, employees and other workers get permits in order to allow them to work in a certain industry. Licenses, on the other hand, are used to allow businesses to start operating. The issuance of permits and licenses is an essential method for helping states in the regulation of invasive items or services. These two can be used to monitor who can possess such an invasive activity and also in what manner. States use licenses and permits to regulate the importation, procession, transportation, and release of goods and services. A license is a legally binding contract that allows someone or something to do, own, perform an action or use a service as long as they agree to the provided terms and conditions. Examples of licenses are driving licenses, software licenses and business licenses. All these have terms and conditions attached to them and must be followed for the license to be put to action. Licenses are granted to the public by the relevant authorities. They are necessary as they grant the government and the relevant authorities an insight into the regulation of various activities, and also help the public engage in regulated activities. The major aim of licenses is to regulate activities and at the same time ensures that the activities are not denied to the public. 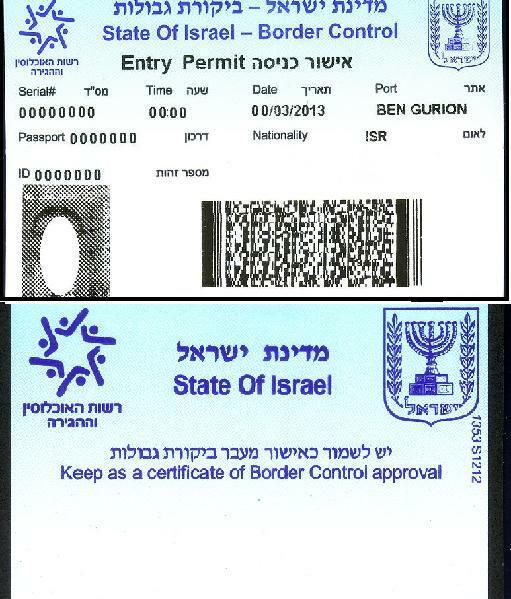 A permit is an official document which gives an individual permission to do carry out an activity. It is also a legal document that a person must have before the onset of a particular business. For instance, a person may have a driving permit before attaining a certain age, and once that age is attained, a license is given. This is the same case for a person who has a license to carry on pest control business but must have a permit to store the chemicals. Permits may also be required in the transport industries to go beyond certain points and transport certain goods. In most cases, licenses are permanent while permits are temporary. For instance, in driving, a permit is valid for up to two years in most places while licenses are permanent, although they can also be annulled in case of misuse of the said license. Licenses have few restrictions if any. On the other hand, permits have a lot of restrictions. Permits restrict on the time an activity can be carried out, who is carrying out the activity, where the activity is being carried out and also whether supervision is available. Most activities that are carried out with the authority of a license do not have such restrictions. For instance, a driver’s license does not have restrictions on where, whom and when to drive, as long it is within the allowed territory. Permits require regular safety regulation inspections from the relevant authorities. Licenses, on the other hand, may require inspection, but not as regular. While appearance is mainly a non-issue, licenses and permits may are in most cases not similar. For instance, most permits may be a sticker but a license may be updated to a card. 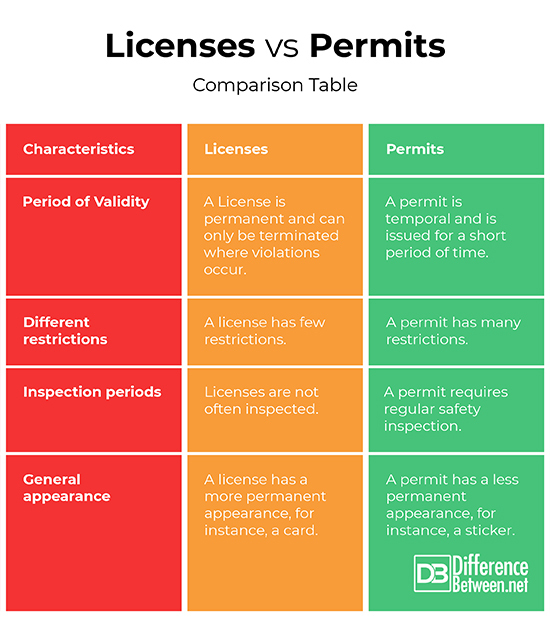 Summary of licenses versus permits. The importance of both licenses and permits is to regulate certain activities and at the same time permit individuals to carry out these activities. Certain activities require occasional inspection and safety regulations adherence; hence a person may be required to obtain a permit even after obtaining a license. Tabitha Njogu. "Differences Between Permits and Licenses." DifferenceBetween.net. 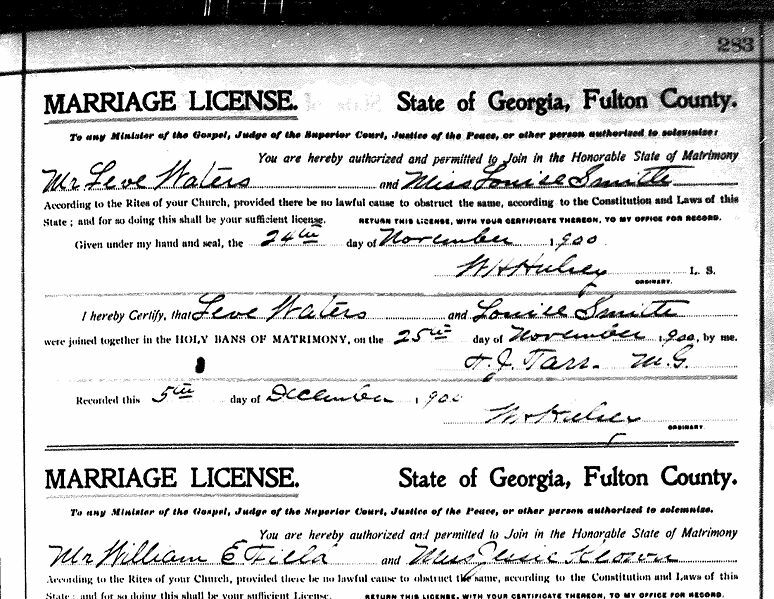 October 4, 2018 < http://www.differencebetween.net/business/differences-between-permits-and-licenses/ >.